- This telescope is a kids telescope with Quick to set up and Easy to use feature. - It comes with the 5X18 Finder Scope that can locate objects faster. - It also includes a Moon mirror that can help you clearly observe the moon. 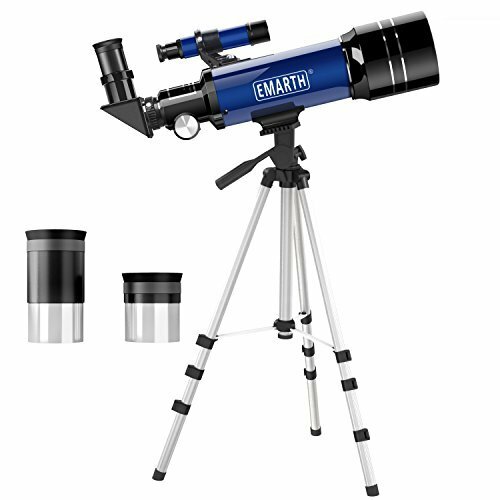 - This telescope is really a great gift for the young astronomy beginners with a gateway to the nature and universe. Place the telescope tube onto the tripod mount. Insert the diagonal mirror into the focus tube. Insert the eyepiece into the diagonal mirror. Adjust the focus knob to view the clear image. The magnification power of a telescope indicates how much an image is enlarged or how big and close it appears to the viewer. The focal length of the eyepiece, combined with the focal length of the telescope, determine the magnification power. To calculate the power of your telescope with any particular eyepiece, simply divide the focal length of the telescope (400mm) by the focal length of the eyepiece (indicated in "mm" on the eyepiece collar). For example, when you use the eyepiece H20mm with this telescope, the magnification will be 20X, when you use the eyepiece H12.5mm the magnification will be 32X. Because there is great deal of reflected glare when the full moon is observed, the addition of the moon mirror will remove this glare and make it possible to sharpen surface details. The moon mirror is screwed into the eyepiece when you view the moon. NEVER aim your telescope at the sun or even close to the sun! Do not let children use any telescope without adult supervision! Portable Telescope that easy to use and suitable for Kids & Beginners. Focal length 400mm, with 5X18 finder scope can locate objects faster. Compass mounted on the Telescope tube, Stars map & Moon map included. 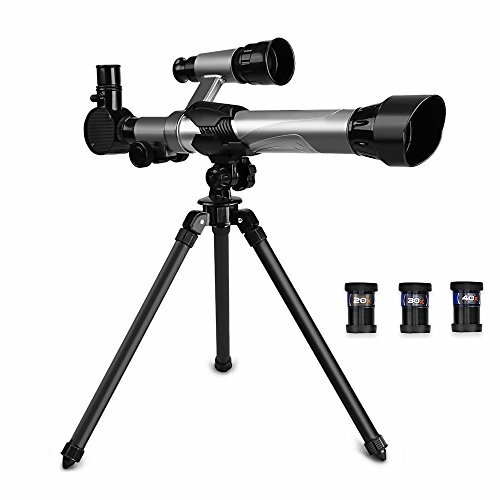 This F400X70 telescope comes with 4 interchangeable eyepieces as well as 3X Barlow lens and 1.5X Erecting eyepiece which you can enjoy different magnifications from 16X to 200X, the 5x24 finder scope helps you to aim the objects faster and easier, the Moon mirror is the best accessory for observing the moon. It is a fun and portable telescope that's sure to inspire the whole family's natural inclination to explore. The focal length of the eyepiece, combined with the focal length of the telescope, determine the magnification power. To calculate the power of your telescope with any particular eyepiece, simply divide the focal length of the telescope (400mm) by the focal length of the eyepiece (indicated in mm on the eyepiece collar). For example, when you use the eyepiece H20mm with this telescope, the magnification will be 20X. The 3x Barlow lens can triple the magnification factor provided by the telescope. Screw the Aiming control into the tripod mount. Place the Telescope tube onto the tripod mount and lock the tube. Locate the Finder scope onto the Telescope tube. Put the Eyepiece into the Diagonal mirror. Portable telescope with magnification 16X - 200X, the perfect First Telescope for kids & astronomy beginners. 70mm Large aperture objective lens make the images brighter and clearer, with 5X24 finder scope can locate objects faster and earlier. Includes 4pcs 1.25 eyepieces H6mm, H12.5mm, H20mm and K25mm. High magnification (H6mm), middle magnification (H12.5mm) and low magnification but with sharper image (H20mm & K25mm) eyepieces give you variety for any viewing situation. With 3X Barlow lens increase the magnification three times, with 1.5X Erecting eyepiece achieve erect images, with Moon mirror that is the best accessory to clearly observe the moon. Travel scope that Easy to carry & Quick to set up - No tools are required for assembly even for the novice. Even the smallest scientists can learn to see the world up-close with My first telescope. Designed specifically for little hands and growing minds with two large eyepieces with a comfy goggle and nose cut-out guide make it easy for little ones discover the world around them. A great introduction to STEM learning for toddlers and preschoolers. My first telescope allows budding scientists to practice mounting a telescope on the included tripod, scan the sky, and point their telescope in the correct direction of their environment to view objects. My first telescope provides your child with moments of discovery and bring distant objects that you can see With your naked eye, closer, sparking their curiosity. Kids telescope for young scientists! The geosafari Jr. My first telescope from Educational Insights is an introduction to a real scientific tool. Designed for kids! My first telescope was designed based on children's Pupillary distance. The squint-free dual eyepiece and nose cut outs are perfect for your little Scientists to view the world around them. Note* Because this is designed for children, the average adult Pupillary distance may cause viewing obstructions. Encourage scientific discovery! Encourage little explorers to practice adjusting the telescope up and down, it may take several tries to get the telescope in the exact position to see the object closer. Spark curiosity! My first telescope title case will provide your child with moments of discovery and bring distant objects that you can see with your naked eye, closer, sparking their curiosity. 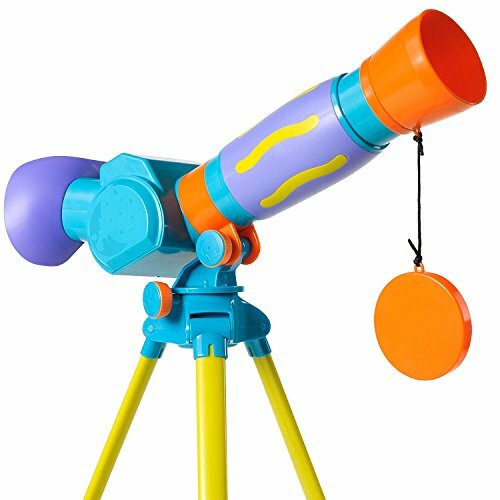 Encourage outdoor exploration with the Green Jumbo Binoculars from Eastern Jungle Gym. 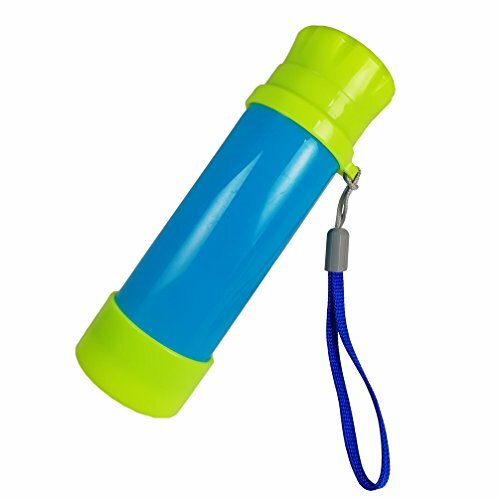 Constructed with heavy-duty, durable polyethylene plastic with UV protectors to prevent color loss, our toy binoculars are non-magnifying and heavy-duty. They are large in size with a length of 11-6/8 and a width of 10-1/2 . Your children will have a blast pretending they are keeping watch in the castle tower, or navigating through the rough seas. Designed to mount on any wall panel or railing, these playtime binoculars come complete with all mounting hardware. 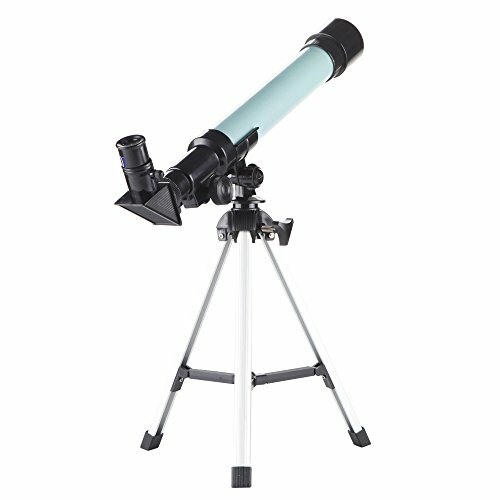 This 360x70mm refractor telescope can be a good observation of celestial bodies and terrestrial objects - best for viewing Lunar and Planetary. Featuring all coated glass optical components, the Travel Scope provides clean, crisp views. Developed with the traveler in mind,this travel scope features a compact and portable design perfect for the on-the-go sky gazer. K25mm, K10mm High quality optical glass lens with magnification of 128X and 51X. Always start viewing with your 25mm eyepiece. This is your low power eyepiece and its wide viewing field will make it easier to locate objects. Once you have located an object and the view is clear you may wish to change to the high power eyepiece. The finder scope provides 5X24 low power magnificationis to help you locate objects in the main telescope. Note: Object in the finder scope are upside down. This is normal and is common to all astronomical telescopes. The telescope is equipped with an azimuth mounting, can be moved vertically. Use the Pan Handle to control the mount for easy pointing to located objects. 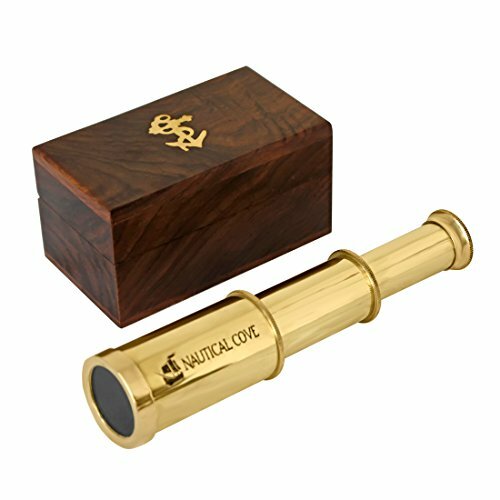 Captains 6" Brass Handheld Mini Telescope with Wooden Box Nautical Collectibles Size: 6" The Nautical Premium Quality 6 inch Golden Brass Spy Glass Telescope is a great gift for a nautical navigator in your family. The spy glass measures 6 inch when its four brass tubes, which are clear coated to protect the brass from tarnishing, are fully extended.This spy glass also comes with a solid brass cap to protect the lens.Simply push the eyepiece in or out to bring the image into clear focus.The 6 inch spy glass is shipped in a beautiful felt-lined brass-inlaid hardwood case. The box features brass side inlets on all sides and the Hampton Nautical solid brass anchor-with-rope logo on the top. A hard wood box is included for carrying and display. Designed in a Traditional International Style. 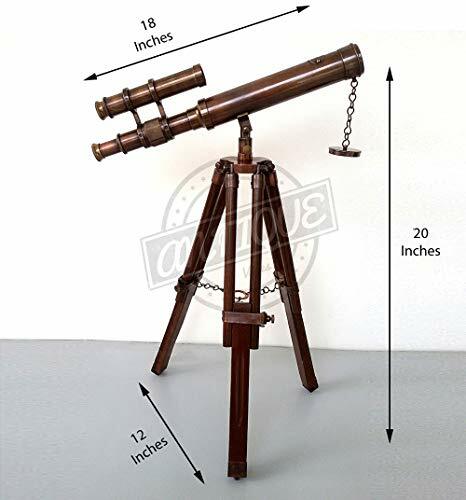 Size:6" This telescope is made from brass and comes with a leather handle. 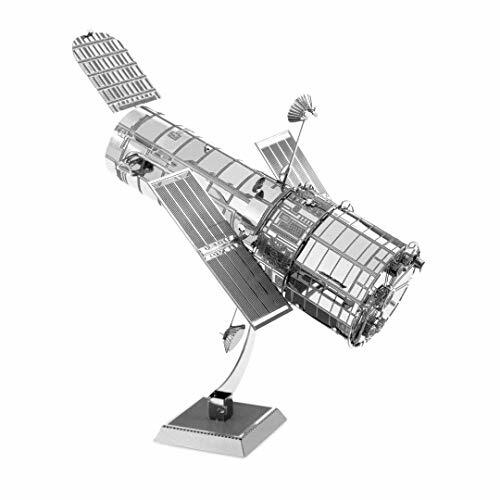 The telescope will magnify far away objects and landscapes with a clear image. The scope extends to a full 6\" and can retract to fit into its own ornate box. The telescope is modeled after older style scopes. It can be focused by fully extending the entire body of the telescope, then slowly contracting and expanding the eyepiece portion only. The magnification is approximately 3x. 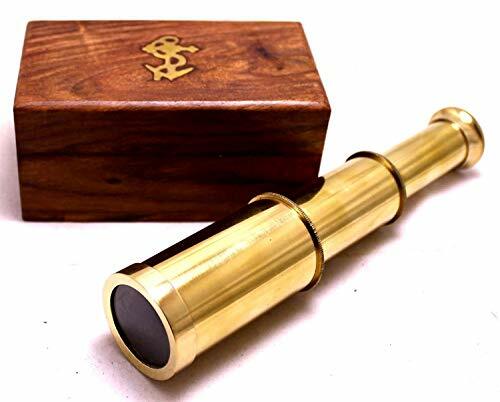 This pure brass pirate telescope is a reproduction of what seafarers used long ago. Offered in two sizes, 6" or the longer 15" version. The smaller telescope comes with a wooden box, and the larger 15" telescope comes with a leather carrying case to store it. Both can be used, though they do not have the ability to adjust the magnification or focus, so it is mainly for fun in use as a toy for kids, or great for a prop in plays, productions, costumes, and more. High Quality Brass Telescope is Perfect For Kids, Props, Plays, Costumes, and Much More! This pirate themed navigation device will ignite your kid's imagination and serve as the perfect prop! Comes with a 30 Day Money Back Guarantee No Risk Ordering! General Features: Aperture 50mm(1.97in) Focal Length: 350mm(13.78in) Focal Ratio F7 Eyepiece1 25mm(0.98in) Magnification1 14X Eyepiece2 10mm(0.39in) Magnification2 35X Max Magnification 105 Finderscope 5*24 Zenith Mirrors 48 Erecting BAK7 prism Mount: Altazimuth Mount Optical coating: Antireflection Blue Film Barlow lens 3X Resolution 4.3 Angular Field of View 2 40" Tuble connection: Altazimuth Mount Screw Tripod Aluminium Alloy Tripod Product Description Gskyer Infinity have over 20 years Optical history,Use of Germany's advanced technology, for different groups of people from different telescopes for science, astronomy, exploration, and tourism, etc. 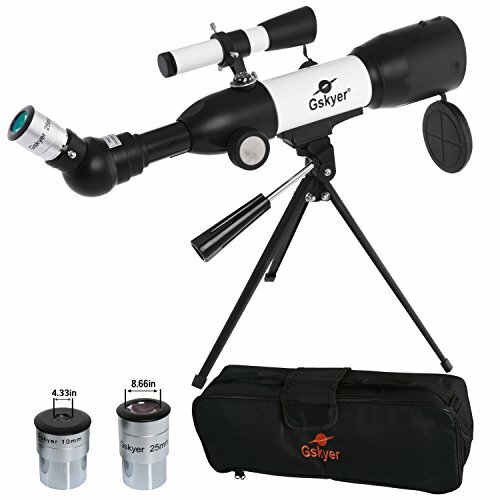 Gskyer's value priced Refractor telescope 50 is an affordable entry level telescope for you and your family. High Quality Optics 50mm Large aperture objective lens makes the images brighter and clearer, 5X24 Finder Scope can locate objects faster. High Magnification Come with two replaceable eyepieces and a 3x Barlow lens. Eyepiece1: 25mm(14X), Eyepiece2: 10mm(35X). 3x Barlow lens trebles the magnifying power of each eyepiece. Complete parts Come with a carry bag, the telescope and tripod can fit inside the bag for easy traveling and on-the-go stargazing. Set Up Easily No tools are required for assembly even for the novice. Just set up in minutes. Satisfaction Warranty Reliable and friendly customer service within a 24 hour time frame. 1-year warranty and lifetime maintenance. 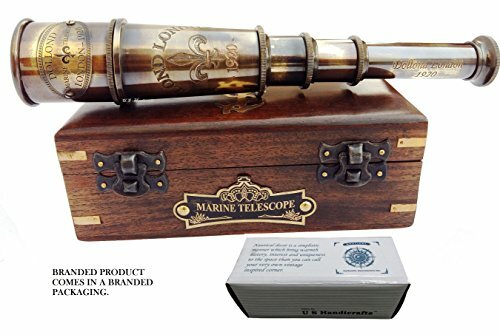 US HANDICRAFTS DOLLOND London 1920 Marine Collectible D cor Nautical Spyglass Antique Mounted Solid Brass 15 Inch Pirate Telescope with Wooden Box. 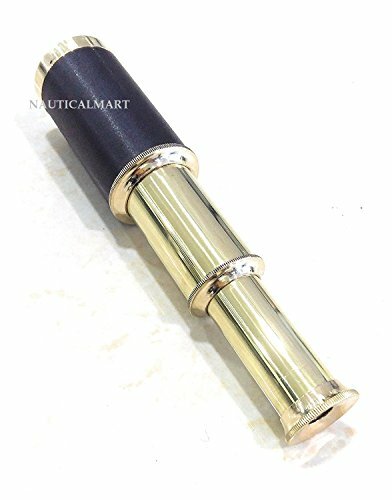 Made up of high quality Brass with DF Lenses Approximately 15" in Total Length Includes a Wood Display Case Modeled after Old Style Telescopes Wonderful Nautical or Pirate Collector Piece. Antique style High quality Telescope with beautiful case, beautiful gift for everyone. RETURN THE PRODUCT IMMEDIATELY , if you will not get the Branded Quality. Unique Antique finish Telescope with Engraved imprints. Manufactured & Sold By AUTHENTIC INSTRUMENTS INC. This easy-to-use telescope is the best choice to introduce your child to the wonders of space! Separate eyepieces for 18x and 90x magnification allow for both wide and close-up views of the lunar surface. Little astronomers can explore the surface including craters, volcanoes, plateaus and more of the moon in great detail with this child-friendly telescope. Quick setup, a stable tripod, and simple vertical and horizontal adjustments make exploring the moon a breeze. 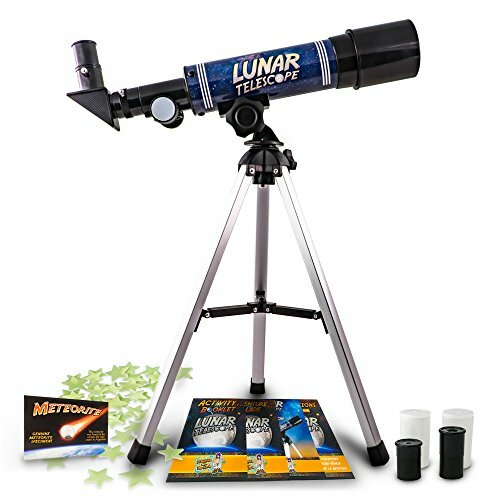 Explore the Moon with this lunar telescope science kit from Discover with Dr. Cool! This easy-to-use telescope is the perfect way to introduce your child to the wonders of space! Quick setup, a stable tripod, and simple vertical and horizontal adjustments make exploring the Moon a breeze. Separate eyepieces for 18x and 90x magnification allow for both wide and close-up views of the lunar surface. Little astronomers can explore the craters of the moon in Great detail With this child-friendly lunar telescope.The lunar telescope science kit includes: a blue lunar telescope with high-quality optical glass lenses An aluminum table-top tripod a chunk of a real meteorite from space 18x and 90x magnification eyepieces the lunar telescope adventure guide, full of amazing facts about telescopes and space The lunar telescope activity booklet with 10 exciting puzzles, mazes and moon-themed challenges a brand You Can trust Discover with Dr. Cool is a name parents trust. Founded by a teacher and life-long rockhound in 2009, Dr. Cool has won over 100 awards for the play value, educational content and overall quality of their toys. All Discover with Dr. Cool products are backed with a 100% satisfaction guarantee. See craters on the Moon with incredibly detailed views of the surface including craters, volcanoes, plateaus and more. Not suitable for viewing other planets and stars. Comes with a genuine meteorite specimen: hold a piece of space! 100% satisfaction guarantee - join the millions of parents who have chosen our award-winning science toys and experience the Discover with Dr. Cool difference! Brand: Discover with Dr. Cool | Manufacturer: JMW Sales, Inc.
Let s explore the solar system! The GeoSafari Jr. Talking Telescope helps kids learn fun facts about outer space without having to go outdoors! Listen closely as this witty little telescope shares 120 cool facts about space, plus a fun quiz-show with 120 questions for the ultimate science show-and-tell experience. Includes 24 eye-opening images straight from the cosmos. Promotes STEM learning and encourages an appreciation of exploration and discovery. Features the voice of Emily Dawn Calandrelli, host and producer of Xploration Outer Space. For ages 4-7. LOOK, LISTEN & LEARN: Teaches kids about space objects and phenomena. Featuring the voice of Emily Dawn Calandrelli, host and producer of television's "Xploration Outer Space"
It's a kids telescope with EASY-SET-UP and EASY-TO-USE features. A kids telescope can get your youngsters started with their new hobby without a large investment, if they are showing interests in STARGAZING and astronomy. This telescope can give your child or grand child a head start in learning with a GATEWAY to the universe. The long focal length and separate viewer allows child to find objects much EASIER. ★Open up a whole new exciting world to your younbster. Broaden their understanding of the universe. Screw the telescope on the tripod. Adjust the focal length to control the clarity. Three different magnification: 20X, 30X, 40X. Focus adjuster: focal length 170mm. Lens cover & Eyepiece cover. Tested according to international standards. The telescope is not able to seize the vision if the star in a far distance. Careful use and regular maintenance are necessary. ⚠CHOCKING HAZARD Not for children underTHREE. EASY-TO-USE This kids telescope could be installed within 3 minutes. Loosen the screws to adjust angle and tighten it when you find your best angle. Magnifications: 20X 30X 40X. Focus length: 170MM. Objective diameter: 60mm. This telescope toy brings child a more generalized picture of nature. Lightweight Table-top Tripod: Make the observation more steady and firm with the design of umbrella shape during observation.Lightweighted plastic toy for easy carry around. This kids telescope is a HEAD START for kids in learning about the nature and the universe.Promotes your kids' curiousity and exploration pleasure. A great gift for the young astronomers with a gateway to the nature and universe. Reliable and friendly customer service promised. 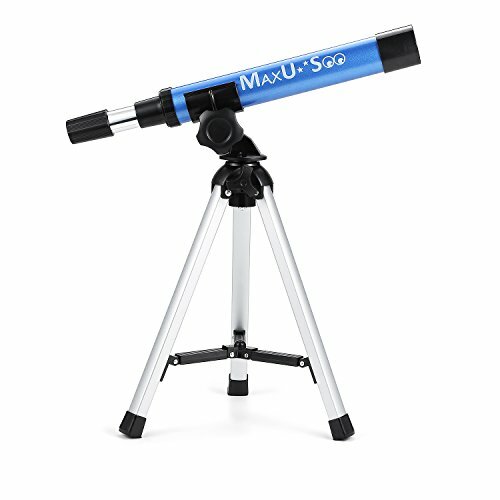 This MaxUSee Mini telescope is designed to show you the moon's craters as well as great views of mountains, valleys, and many other subjects, including birds and other wildlife, it is perfect for Kids to view the landscape and sky space. The optical system is with full coated optical glasses that allow you to view clear, crisp images. This scope is easy to carry and assemble quickly, the telescope tube can also be easily removed from the tripod for hand-held use, it is very suitable for family travel. a) Spread the tripod legs and push down on the tripod support struts until the tripod legs are spread as wide as they can and the tripod support struts are straight. b) Carefully push the optical tube down into the tube attachment bracket until it is firmly held in place. a) Remove the plastic dust cap from in front of the 30mm objective lens. b) Loosen the horizontal motion lock and the vertical motion lock by turning the knobs counterclockwise. c) Aim the telescope at the subject you want to look at. d) Place your eye just behind the eyepiece. e) Slowly push or pull the eyepiece until you see your subject sharply. f) If you want to keep your telescope aimed in this direction, tighten the horizontal and vertical motion locks by turning them clockwise. Mini Telescope suitable for Kids, Great for Land and Sky viewing. Portable scope with full coated optical lens allow you to view clear, crisp images. Spotting scope with metal tabletop tripod and the telescope can be easily removed from the tripod for hand-held use. Metal optical tube with focal length 300mm, magnification power 30X. Traval scope that Easy to carry & Quick to set up. By the means of the optical instrument, you can see the images of space and stars. The device can improve their hand-eye coordination and expand their horizons. It is easy to assemble and operate the telescope so that it is suitable for children. HIGH MAGNIFICATION: 170mm focal length and 56mm aperture,fully coated optical glass with high transmission coatings creates stunning images with increased brightness and clarity.Perfect telescope for kids and beginners to explore the starry sky. EASY TO SET UP: The telescope and tripod are simply assembled by a screw, no other auxiliary tools are required.Great on-the-go telescope for children who love science and astronomy,encourage them to do exploration. DURABLE TRIPOD: Adopted ABS tripod, lightweight yet durable and stable in use.Foldable design allows to carry around easily or can be stored in the truck of car when you go hiking. 3 INTERCGANGEABLE EYEPIECE: This telescope provides 3 eyepiece: 20X/30X/40X interchangeable, high quality optics and give you a clear images.A finder scope for easy locating, satisfied your kids curiosity. WIDELY USE: OUTLIFE telescope, easy to set up and use, perfect for children and beginners. You can satisfied your kids curiosity about sky and astronomy at home.Lightweight and portable design is great for hiking, traveling or any other outside adventure. It's easier to find the target, and easily discover the mysteries of the universe. With 45 erecting image zenith mirror, you can view erect image and just look down with a comfortable angle. 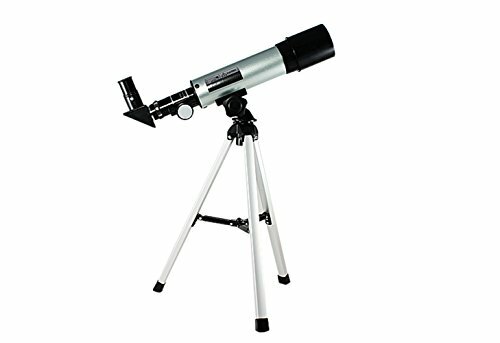 This telescope come with a adjustable tripod to make the observation more steady. The viewing height and angle can be adjusted to meet different viewing needs. They cut down glare and enhance Definition and Resolution in Lunar Planetary Observation and brings out much more surface detail. Come with smart phone adapter and camera shutter wire control, you can take pictures or videos and share them with your family and friends. With high-quality optical materials and production technology, telescope are durable and solid, greatly extend their service life. Object in the finder scope are upside down. This is normal and is common to all astronomical telescopes. Never point your product at the sun, or even near the sun! Fully coated glass optics with high transmission coatings for enhanced image brightness and clarity, perfect for land viewing and gives nice views of astronomy, like the moon, planets, scenery, birds. Accessories include: smart phone adapter, camera shutter wire control, adjustable tripod, moon filters, two eyepieces, 45 erect image diagonal, 5x24 finderscope, user manual, backpack. 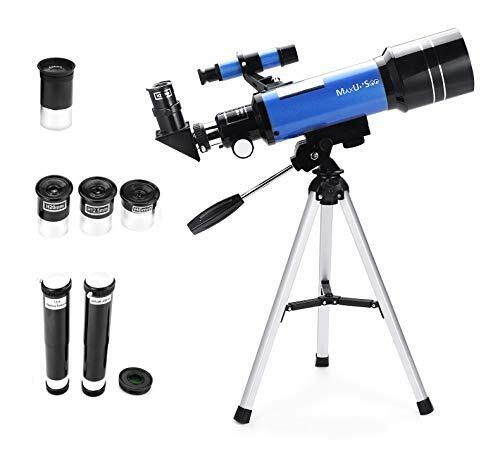 Kids telescope with K25mm and K6mm providing 16x and 66x magnification, 400mm focal length from the 70mm objective lens, offers high-magnification viewing of planets and wildlife. 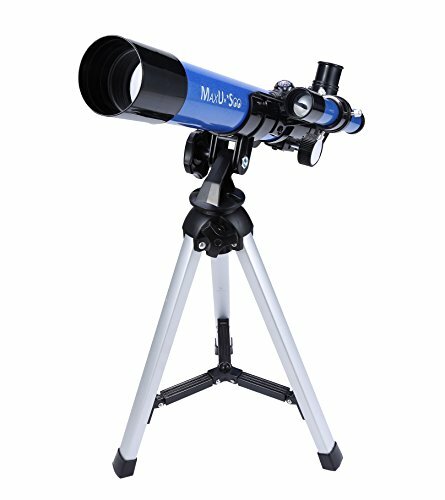 This telescopes for astronomy beginners is very easy to carry with compact and light weight design. Easy to set up without tools, perfect for children and novice. MAXLAPTER Worldwide Warranty - lifetime warranty, worry-free purchase. Guarantee unconditional refund within 30 days, no longer worry about any quality problems and after-sales service! Arrrr you planning a pirate party? You need themed supplies & favors! 3.5" black telescopes extend so little pirates can look far into the distance. 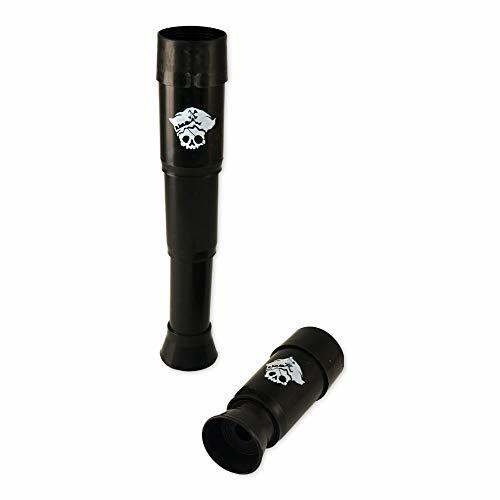 Black plastic telescope toys feature a Jolly Roger skull print that fit perfectly with a pirate or shipwrecked theme. Small toys are great for party favors, goody bags, classroom handouts, patient rewards, carnival prizes and more! Package includes 12 telescope toys. Arrrr you planning a pirate party? You need themed supplies & favors! 3.5 black telescopes extend so little pirates can look far into the distance. Black plastic telescope toys feature a Jolly Roger skull print that fit perfectly with a pirate or shipwrecked theme. Small toys are great for party favors, goody bags, classroom handouts, patient rewards, carnival prizes and more! Package includes 12 telescope toys. Does your kids like the pirate? This is a high-definition high-powered low-light monocular. This high-powered telescope delivers superb clarity and brightness, and is waterproof and anti-fog, making it easy to enjoy your favorite outdoor hobbies and make your journey even more exciting. Telescope use: Telescopes designed for outdoor activities such as hunting, bird watching, hiking, hiking, tourism, boating, wildlife watching and landscape viewing; this high-powered telescope can also be used to watch large-scale stage performances, concerts, Sports competitions, etc. 1. Delivery time is 7-15 working days. If you can't receive the order within 30 days, please contact us. 2. We only sell telescopes, not including others. 3. Due to different shooting angles, there will be color difference, please refer to the actual product. 4. Due to the manual measurement of the size, there may be an error of 1 to 3 cm, please understand! Easy and portable : After using the telescope for a long time, there is no fatigue, eye fatigue and headache. Our portable monoculars make it easy to take outdoors and enjoy the beauty of the scenery anytime, anywhere. Comfort Experience : This telescope has 12 times high magnification and 50mm objective lens to provide first-class clarity and brightness; especially suitable for outdoor activities such as hiking, hiking, driving, watching wildlife and scenery, making the journey even more wonderful. Easy to use : Our professional monocular can adjust the perfect focus in a few seconds, very easy to use, even suitable for children, as well as adult males and seniors. 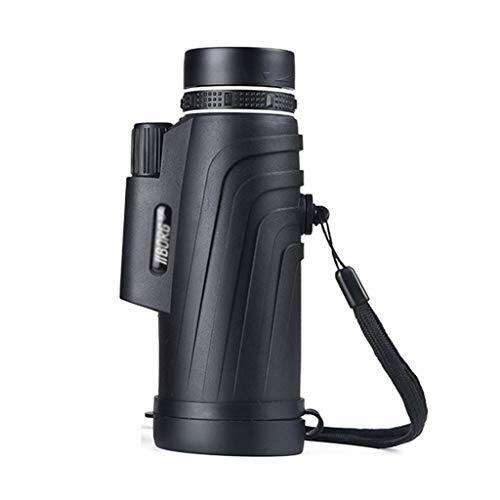 Quality Material : This monocular is made of high-quality metal frame and optical glass. It is comfortable, safe, environmentally friendly and durable. Satisfaction Guarantee : Our mission is to show how as many people as possible are important and fun to be active and seek adventure. We are very confident in our telescopes. We provide excellent customer service. We will solve any problems immediately, please contact us in time. 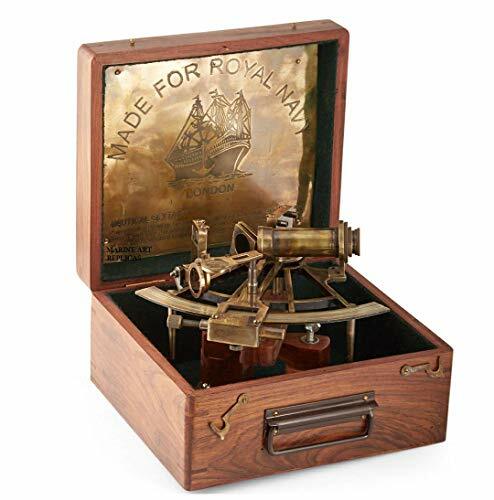 8'' Maritime Antiques Marine Captain Sextant with Wooden Box. Brass Sextant is the best gift for your family and friends. Perfect for table decoration, Collectible gift or for those who were in navy. Three "big": 70mm big objective lens for wide field of view; big sunshade design for blocking stray light into the lens effectively; big focus adjustment wheel for accurate focusing. Adjustable tripod: this telescope come with a adjustable tripod to make the observation more steady. The viewing height and angle can be adjusted to meet different viewing needs. Photograph and sharing: come with smart phone adapter and camera shutter wire control, you can take pictures or videos and share them with your family and friends. Excellent workmanship: with high-quality optical materials and production technology, telescope are durable and solid, greatly extend their service life. 45 Zenith Mirror: With 45 erecting image zenith mirror, you can view erect image and just look down with a comfortable angle. 4 Color Filters Set: They cut down glare and enhance Definition and Resolution in Lunar Planetary Observation and brings out much more surface detail. 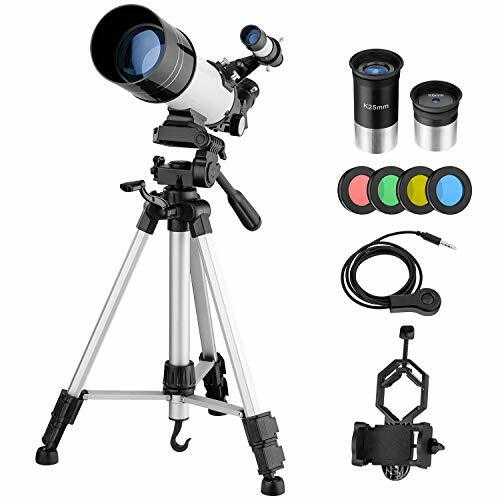 Telescope for astronomy beginners: fully multi-coated lens with high transmission of 99.5%, enhanced image brightness and Sharpness, furthermore, it will protect your eyes even though used for a long time. Different use: come with two replaceable eyepieces (K6mm 66x K25mm 16x), magnification eyepieces give you variety for any viewing. Easy to set up: with solid structure, this telescope is quick and easy to set up without tools and will encourage kids to love learning about astronomy and nature. 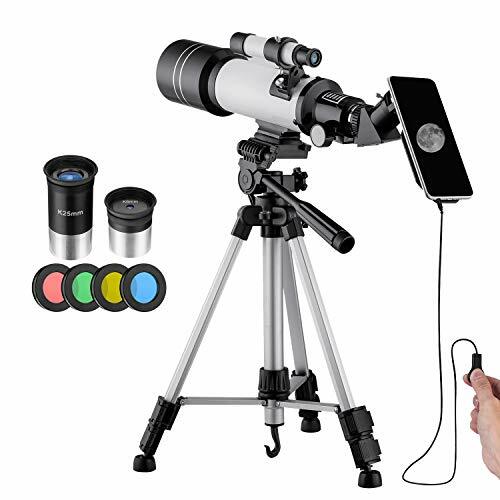 Good gifts for kids or beginners: professional telescope with smart phone adapter, camera shutter wire control, adjustable tripod, backpack and other useful accessories. It's a meaningful and nice gift for birthday or Christmas.